The last few weeks have been filled with work stress for one of us here at No Kids, Will Travel. We felt the need to do something different that would force two social media professionals to unplug for at least an hour or two. 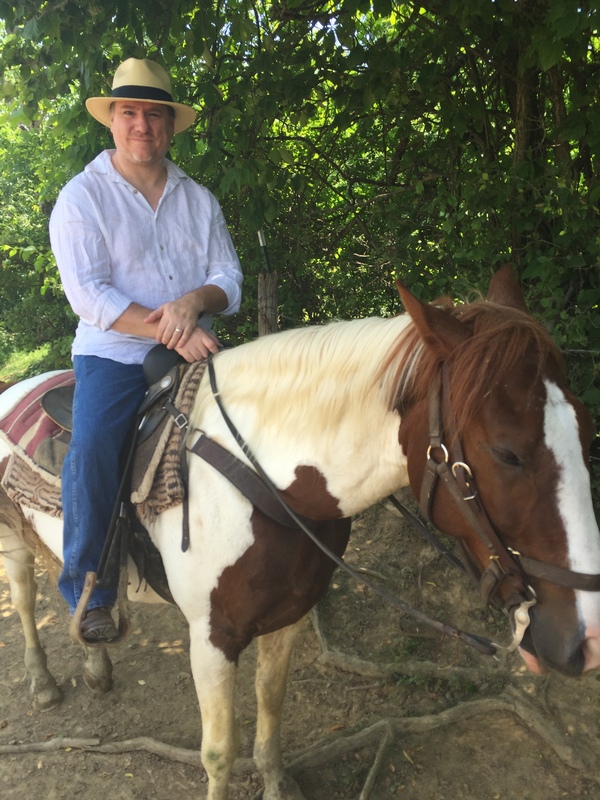 So, last Saturday after a night of tossing and turning because our brains wouldn’t shut down, a brilliant idea popped into my head: horseback riding. It would involve all of our attention and get us out of the city for a little while. After a quick search of the web and a look at the reviews on Trip Advisor the spur of the moment decision was made, we would go riding that morning. The Rolling Hills Ranch in Bridgeville, PA is only about a half hour outside of the city, but seems like a world away. We gave them a call ahead of time thinking we’d need to make reservations, but were told we didn’t need any and to stop by anytime. The ranch sits on 70 rolling acres and has been offering trail rides and lessons for 50 years. We walked up to the counter, a window cut in the side of a barn, and announced that we were there for a trail ride. We were directed to fill out a liability form, which was simply listing our birth dates and signing our names to acknowledge we understood the risks of riding and riding without a helmet. We then payed our $25 fee and were directed to wait outside the barn as a young man led out two horses. Both were acquired at auction from the Bureau of Land Management, and both were beautiful. One had a blonde coat and mane and the other had two-tone coloring like a southwest mustang. The horses, named Petey and Pally, weren’t big and intimidating either — they were definitely used to riders who hadn’t been in the saddle in a long while. The horses were also obviously familiar with the trail and terrain. We set out across an open field, sticking to well-worn paths. Getting up into the saddle lifted our spirits almost immediately. Looking across the field to the hillside where dozens of other horses grazed on the near-cloudless day it was impossible to stay tied to the stress of the work-week. After a quick pit stop for water (drunk from a metal trough that was home to a couple of large goldfish), our horses and guide led us into the forest. We followed paths up and down hills — Pittsburgh isn’t exactly known for its flat, open spaces — coaxing our sometimes reluctant horses to keep up the pace. At the top of the highest hill we found another field and rested in the shade for a while. On cooler days you can practice cantering or galloping, but with temperatures in the 90s it was kinder (for the horses and riders) to take it easy. Zeke atop his horse, Petey. We returned to the barn about the same way we came out. Our guide gave us directions (“keep turning right until you hit the big muddy area — then turn left”) and we were back under the shade of tall trees, following the trails home. With the exception of one moment when Pally decided he didn’t want to lead the way any more, the horses were eager to deliver us to the barn. Pally broke into a trot as we entered the field where our journey began. The trail riding is offered with or without guides. The ranch considers the trail riding to be “semi-guided” allowing riders, depending on ability, enjoy as much of the 70 acres as possible. Rolling Hills Ranch also offers group rides (12 or more persons) but you need to call in advance and make a reservation for such a large party. One of the most special things Rolling Hill Ranch offers is moonlight rides. You saddle up and go for a trail ride under the stars for an hour and a half before returning back to the ranch for a catered dinner to enjoy fire side. The moonlight rides start at 9 p.m. on select dates in the summer and must be booked in advance. The cost for the nocturnal adventure is $60. The ranch’s general hours are Monday through Friday, 9 a.m. to 8 p.m., and 9 a.m. to 6 p.m. on Saturday and Sunday. 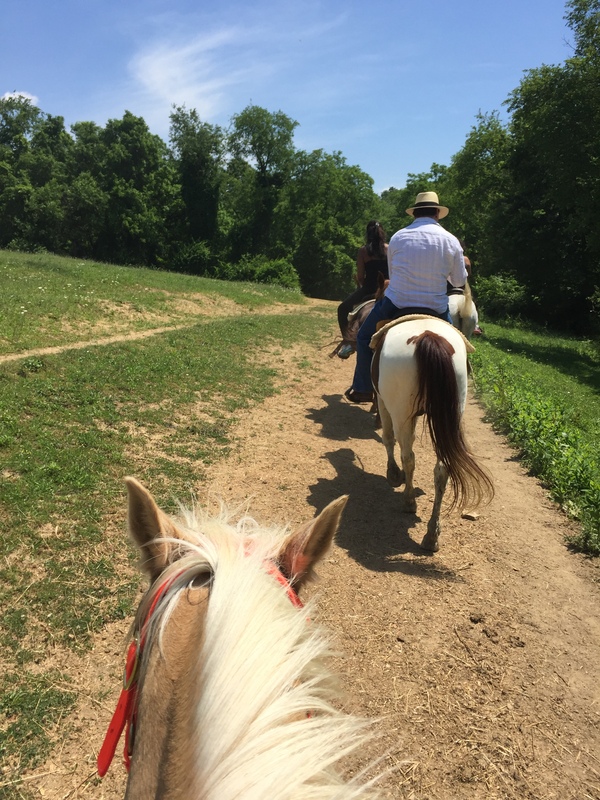 We had a lot of fun on our adventure into the hills on horseback and would recommend the ranch for its convenience to Pittsburgh, the friendly service, and its calming effect. It helped at least one stressed out would-be jet-setter disconnect and forget about the hectic world — for at least an hour or two.